24 duets and eight teams will be competing in the synchronised swimming competition at the Maria Lenk Aquatic Centre in Rio from August 14-19. The first 10 spots on both lists were awarded on the basis of the results of the 2015 FINA World Championships 10km race, in Kazan (RUS). 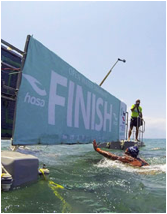 20 more spots (10 men, 10 women) were attributed to the best of the Marathon Swimming Olympic Games Qualification Tournament in Setubal (POR) in early June. In addition, the next-best from each of the five continents also earned a berth in Setubal. A total of 136 divers, represented by 68 men and 68 women, are confirmed. 29 nations will be going to Brazil. In water polo, 12 men's teams will battle for the Olympic titles, while eight women's squads are taking part in the Olympic tournament. Lac St Jean, Quebec, Canada, is about to host the fourth leg of the FINA/HOSA 10km Marathon Swimming World Cup 2016. 36 swimmers*, 22 men and 14 women, will take the departure on Thursday July 28. Open Water greats such as Germany's 2009 World Champion Angela Maurer and Kazan 2015 Team event winner Christian Reichert or Rio 2016 hope Diogo Villarinho of Brazil and national favourite Richard Weinberger are among the athletes to watch. In addition to the FINA/HOSA 10km Marathon Swimming World Cup, Lac St Jean will also stage the third leg of the FINA Open Water Grand Prix, on July 30. As FINA is entering in the second semester of the aquatic calendar, the FINA/airweave Swimming World Cup 2016 is around the corner. The prestigious annual circuit will kick-off on August 26 in Paris-Chartres, France. The competition will be divided into three clusters with prize money up for grabs and will conclude on October 30 in Hong-Kong. The competition will take place in 25m pools this year.